On this episode Corrie is joined by Romany Romany an international magician, comedienne and author. Romany has had a long 40 year journey to get to her rightful place on stage. After being “stage-struck” as a child, she set off on a dream to become a ballerina, only later to feel judged for her physique. This led to a long battle of living secretly with an eating disorder, which was her own attempt to create an ideal ballerina body. Along the way she gave up on her dream to settle for a traditional life, only to have more adversity thrown into her path. Little would she know that her path to the stage would be with magic. 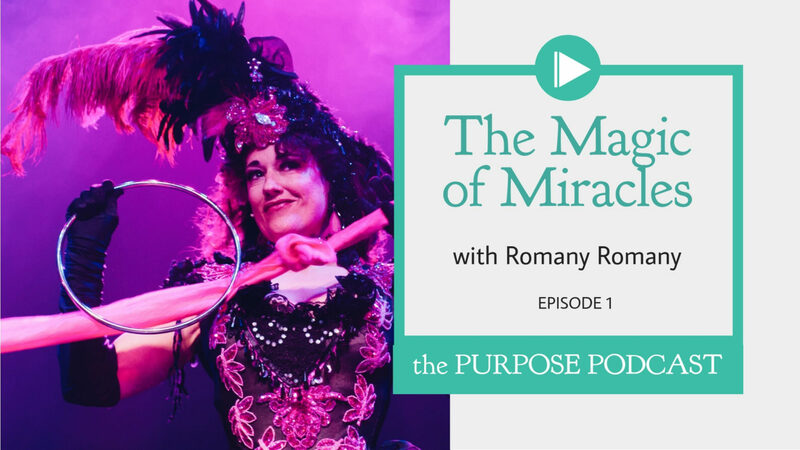 Romany shares the magic of miracles and how with faith they can take us to wherever we are meant to be in life. Romany ~ ‘Diva of Magic,’ is a magician, artist, dog-lover and baker of bread that is dangerously delicious. She performs her one-woman comedy magic show around the world making people wonder and smile. She’s the first and only woman to named The Magic Circle Stage Magician of the Year, the only British winner of the prestigious Las Vegas World Magic Golden Lion award, and a member of the exclusive inner circle of The Magic Circle. She travels the world headlining on luxury cruise ships & working in beautiful theatres. She has an extraordinary story to tell. Romany lives in the Sequin Palace of Dreams in Brighton, England with Bongo, her beloved black labradoodle and a very patient husband called Walkabout, who is not a dog. This entry was posted in The Purpose Podcast and tagged accident, adversity, eating disorder, hospital, podcast.